What Am I Going To Do With All These Olives? | Keep It Up, David! I love olives, but I want to use them in new ways, apart from eating them straight from the jar (even though that’s a perfectly suitable option). I had some tilapia thawing, so I decided to make a green olive topping for my fish. I don’t even think this is a recipe – it’s just how I threw together stuff I already had. But it’s a good example of how I cook and eat, so… here we go! 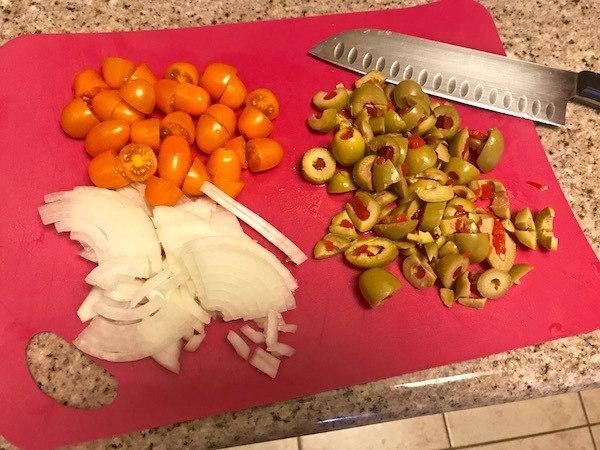 I coarsely chopped about 15 olives, and the rest of the orange grape tomatoes I had. I also sliced up 1/4 of a huge white onion. They went into a skillet with a spoonful of chopped garlic (from a jar), and they all got friendly as they sauteed and softened. 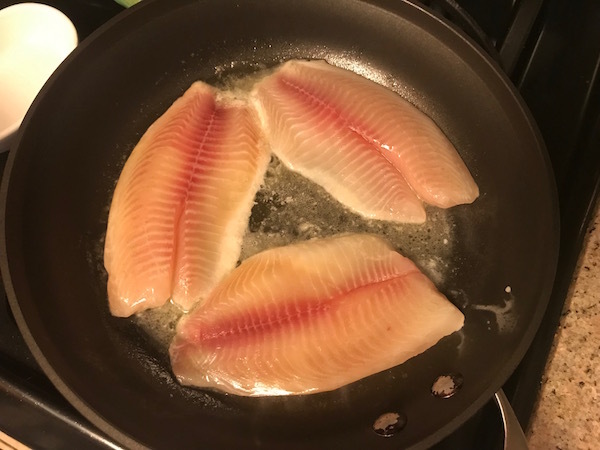 Meanwhile, in a bigger skillet, I cooked the tilapia in a mixture of butter and lemon juice. In only took a couple minutes on each side. My meal came together quickly! I put my topping on the green beans as well because… why not? It was delicious. 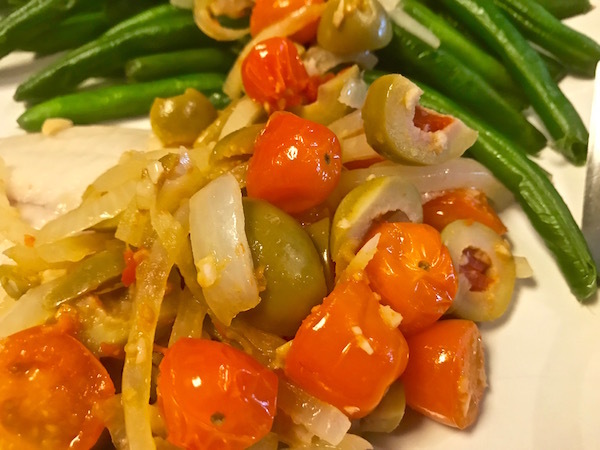 You can’t go wrong with onions and garlic, and the tomatoes were a little sweet and the olives nice and briny, so lots of flavors there. And the olives were stuffed with pimentos, so that’s an added bonus! Plus, I had lots extra, so I’m looking forward to the leftovers. I might heat up the fish and olive mixture in the microwave and then add it to a spinach salad or something. In other food news, I tried bone broth for the first time. I bought a container at Sprouts, at the same time I bought the olives. Bone broth was kinda trendy a couple years ago (and maybe it still is? I’m not sure), and people were sipping it like tea because of its benefits. Because it’s made from bones, it supposedly has more minerals and nutrients that are good for your immune system, gut health, and so on. I heated some up, poured it in my Passions mug, and sipped. Guess what? It tastes like stock. Because that’s basically what it is. I’m just glad the Sprouts store brand isn’t crazy high in sodium (230mg per serving), because a lot of soups and broths are ridiculously salty (3 or 4 times the sodium). I’ll finish this container, over the next few days, and maybe I’ll buy more bone broth to have on hand for soups and recipes, but I don’t think I’m gonna fall on the sip-it-every-day bandwagon. And I know you’re wondering about my Passions mug. Yes, it’s swag from the old NBC soap opera, and YES, I watched it religiously for about 5 years, until it was cancelled. I loved it. Remember when Endora used magic to turn a picture book about a mermaid into an actual mermaid, who then tried to seduce Miguel? Lastly, if you have any favorite healthy meal ideas that involve green olives, pipe up in the comments section! This entry was posted on Thursday, January 17th, 2019 at 9:14 pm and is filed under Uncategorized. You can follow any responses to this entry through the RSS 2.0 feed. You can leave a response, or trackback from your own site. 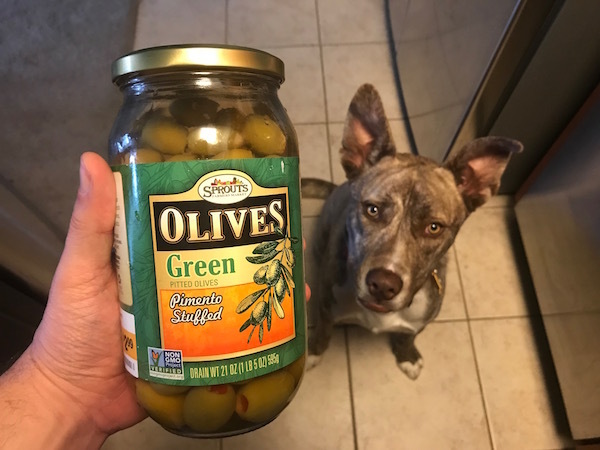 3 Responses to What Am I Going To Do With All These Olives? Looks great! And I hadn’t heard about the bone broth trend, although I see bottles everywhere in stores. So good to know. 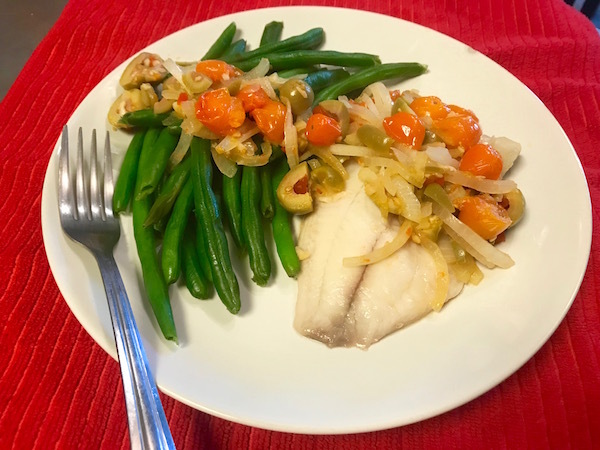 Your “olive-fish-green-beans.jpg” looks so ritzy & yummy! Great job! 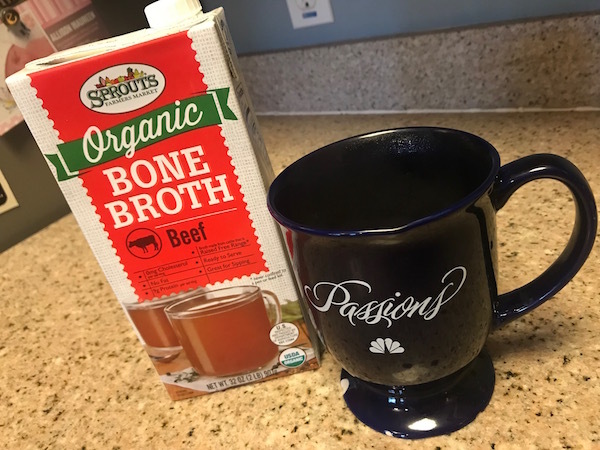 I began drinking bone-broth daily a couple years ago & noticed benefits (fat+protein=feel satiated enough to skip lunch), so I typically keep 2-4 cases of 12 in stock at home–with long expiration dates, they double as excellent emergency supplies (“liquid calories”). The Sprouts brand is great when it’s on sale for $3 per 32oz container, though it’s not the highest quality. Those are in the freezer or refrigerated section, but they’re about 4x pricier. And regarding salt, last year I began adding a teaspoon of salt to each carton because my body manages sodium levels well (daily sweats; confirmed w/ blood tests last year). Love all the bone broth info, G.M.! Thanks!